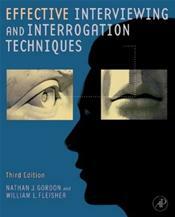 Effective Interviewing and Interrogation Techniques, Third Edition is a practical manual which provides the forensic practitioner/investigator critical insight into human behavior, enabling one to become a better interviewer, interrogator and, most importantly, an expert detector of truthful and deceptive behavior. The Forensic Assessment Interview Technique (FAINT) and the Integrated Interrogation Technique (IIT) were developed at the Academy for Scientific Investigative Training and are used by forensic practitioners and investigators to detect truthful or deceptive behavior. FAINT is applicable to all forensic type interviews and incorporates the assessment of nonverbal behavior, projective analysis of unwitting verbal cues, statement analysis and the Morgan Interview Thematic Technique (MITT). This volume teaches how to combine, apply and quantify these techniques to reach a numerical conclusion to the truthfulness of the interviewee. The third edition expands chapters on torture, assessing the interview, statement analysis, MITT, and interrogation. It contains new chapters on passenger screening, and report writing, along with new case studies. Also covered are ways to maximize the collection of information from a prospective employee, and legal considerations.